In the top picture, from the Codex Mendoza, there’s an Aztec incense bag tied to a bunch of canes - part of a list of tribute paid each year to the Aztecs. If you saw an incense bag being held by someone (see Pic 1) - well, it was an incense bag. 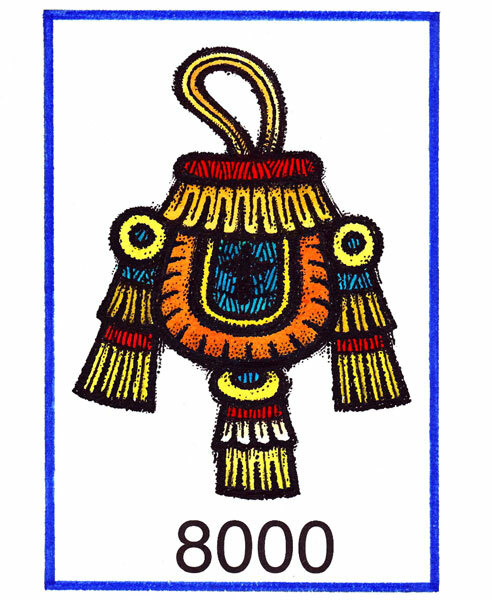 But if it was on its own as a symbol, it was being used as a ‘glyph’ to show a number: in this case 8,000. Pity the poor folk that had to pay the Aztecs 8,000 canes every year in tax! 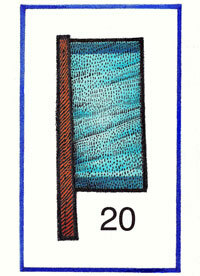 The symbol for 20 was a little flag or banner (see Pic 2), and the Aztec word for 20 was cempoalli meaning ‘one count’. 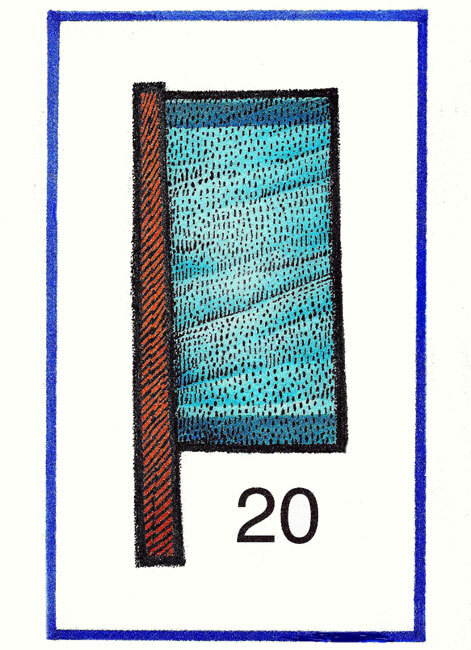 Up to 20 you could show numbers just by the right number of dots (or sometimes fingers). It was common among other ancient Mexican peoples to use a bar for 5, but for some funny reason the Aztecs insisted on being ‘dotty’..............! From 20 up to 400 you could join flags together (100 would be 5 flags alongside each other) and add dots to them if need be. 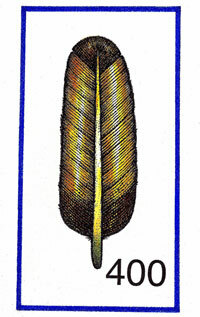 400 - which is 20 x 20 - had its own symbol, a feather (see Pic 4). 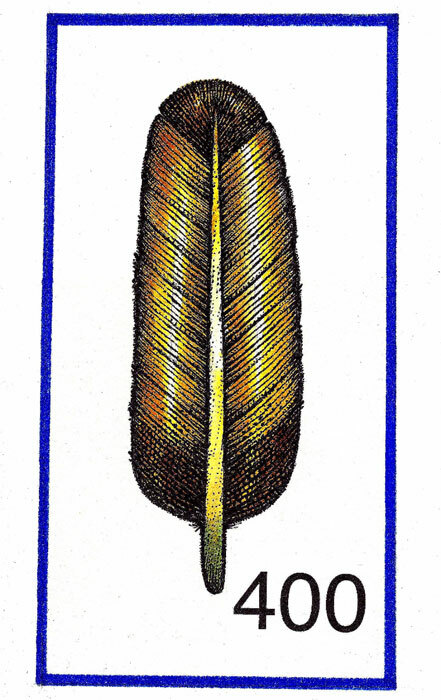 Some people say it was more like a hair or even a fir tree: the idea is the same, “as numerous as hairs or the ‘barbs’ [branches] of a feather...” The Náhuatl word for 400 was tzontli or hair. 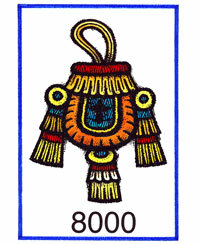 Finally, 20 x 400 = 8,000, and the symbol for this was the incense bag or pouch (see Pic 5). The Náhuatl word for this was xiquipilli. Why a bag? Perhaps to show the almost uncountable contents of a sack of cacao beans. So drawing 8,000 of something was a bit like saying ‘a sackload’ of whatever it was... 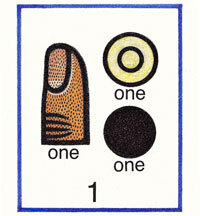 In fact the Aztecs/Mexica always measured their tribute by count and volume rather than by weight. Thanks to our friend Felipe Dávalos for illustrating the number symbols specially for us! - a real ___ load of numbers! A very poor, even annoying explanation. I had to force myself to read all of it. It could have been so much simpler and easy to understand It’s not as if there weren’t numerous examples of how it should be done. Mexicolore replies: REALLY sorry you suffered so much reading this very humble contribution to kids’ education. Like so much run-of-the-mill negativity nowadays, your feedback doesn’t contain a single suggestion or specific point of discussion, nothing you could deem to contribute by way of improvement. Typical. Still, here’s wishing you a Happy Christmas...! Many thanks for another amazing day at Danes Hill. We all loved it. Mexicolore replies: Thank YOU. Danes Hill School always give us a great welcome and look after us really well - a lovely school! 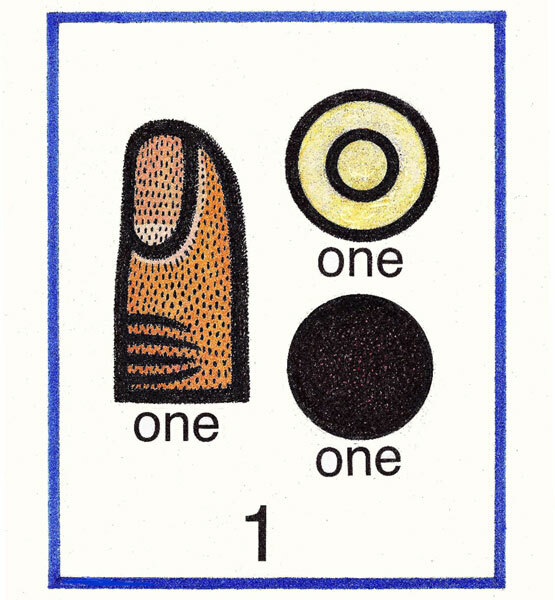 Hi I was wondering when the page on Basic Aztec facts: Aztec Numbers was published? Mexicolore replies: I’m afraid we don’t have an exact record, but it must have been around September 2012.
thanks helped with my posterboard! thanks for helping me with my home work!!!! so what would the aztec emperor do to ask for 8000 bee hives? Mexicolore replies: He’d put out an order for 8,000 bee hives! More seriously, he’d draw a pottery jar of honey, and ‘attach’ to it with a thin black line the glyph for an incense bag, meaning 8,000. Honey was traded, according to the Codex Mendoza, in ‘little jars’, not in bee hives. Mexicolore replies: Yup, dead on. wow this was exactly what i was looking for thanks so much!!!! i think its amazing to find what your looking for! What is Friend and Good Bye and Hello in Ancient Aztec? Mexicolore replies: Thanks, Josie. In Náhuatl (the Aztec language) ‘friend’ would be icniuhtli, ‘hello’ is niltze! and the closest to ‘goodbye’ might be ‘Be well’ - Ma xipactinemi. (The ‘x’, BTW, is pronounced ‘sh’). Well, at least ‘hello’ is fairly easy!